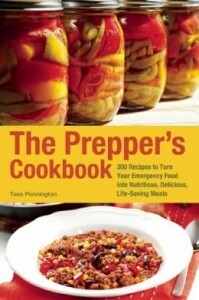 Tess Pennington of Ready Nutrition has a new food storage cookbook out: The Prepper’s Cookbook: 300 Recipes to Turn Your Emergency Food into Nutritious, Delicious, Life-Saving Meals. The book focuses on foods that are commonly stored and inexpensive to stock and really does have 300 recipes. There are recipes for breakfast, lunch, supper, sides, breads, desserts, beverages, and more. And she’s even got a few recipes for the prepper classics, Spam and Ramen. Many of the recipes do assume that you’ll have some way to either bake or boil, so you might need to get creative in a real grid-down type of scenario, but they’re great for rotating your food storage into your every day eating. Some of the recipes have non-shelf-stable ingredients like eggs, vegetables, or meats. Most of these recipes can be made food storage friendly by substituting ingredients using the chart that is included in the book. The book isn’t just a recipe book. She also includes information on preserving food including canning and dehydrating, ideas for substitute ingredients and stretching meals, and instructions and lists for creating your own food storage pantry. This is really a well rounded food storage recipe book, especially if you are just getting started or if you’ve got some basics stored and are looking for some new ways to mix them up. The Prepper’s Cookbook is a little over 200 pages and available on Amazon or Barnes and Noble.